Christmas Day was my next hike. The previous day I enjoyed my Christmas celebrations in the evening, presents and a solid attempt at a Christmas dinner were seasonally achieved and it left me with a huge craving for exercise. 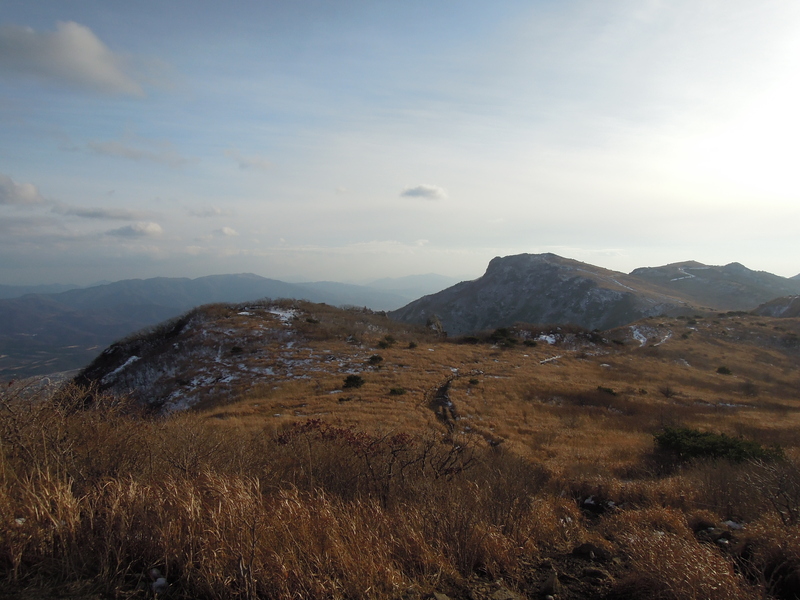 On the last hike I had spied an ominous ridge far across the river valley and after some considered research I discovered it to be part of the ‘Yeongnam Alps’. I planned ahead and noted the features I wanted to explore and found myself on the same number 12 bus that I had taken the previous week, only this time staying on it a bit longer and heading west not east when I disembarked. This time I was alone, but that was good in some ways as I could go as fast as I liked and take on a more challenging route. 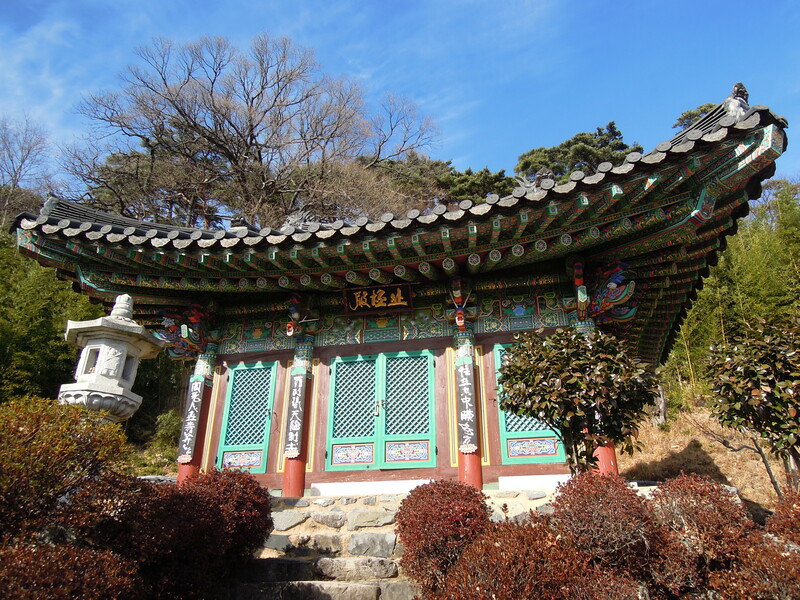 The beginning of my route began at Tongdosa, a Buddhist Temple considered as one of the three most important ones in Korea and reason enough to head this way. 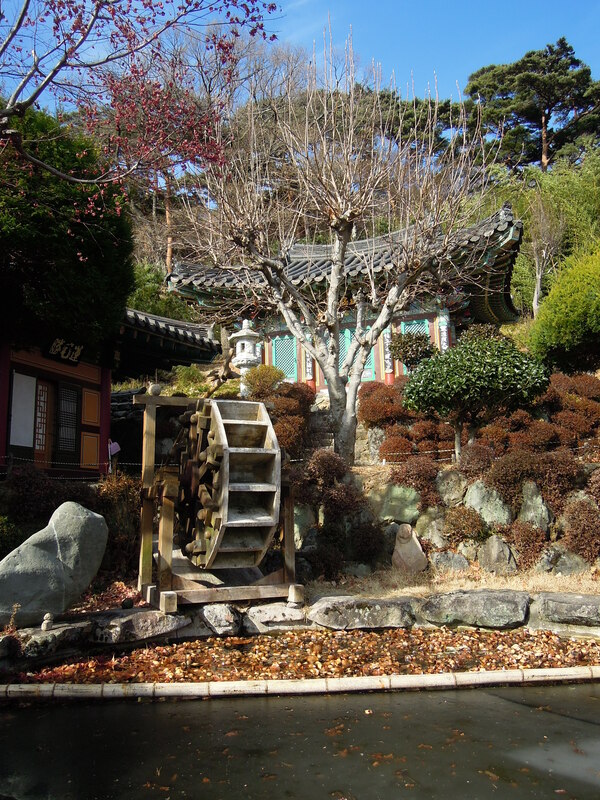 I walked the first few kilometres from the bus station and found myself in a bustling and diverse temple grounds. 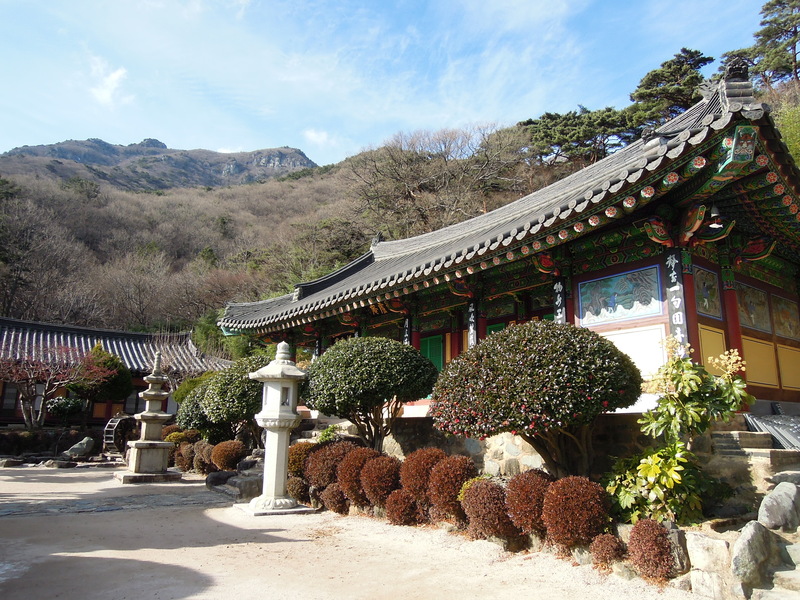 Walking around Tongdosa was an interesting experience. 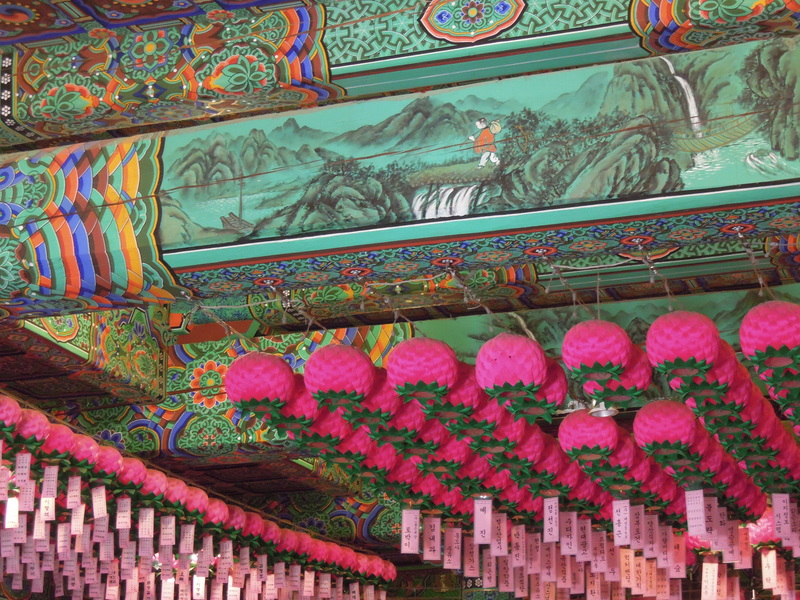 I couldn’t claim to be incredibly knowledgeable about Buddhism in Korea but I’ve certainly come to realise that each temple is independently unique in atmosphere and styling. The Tongdosa experience began with a walk along a small rocky river bed pathway. 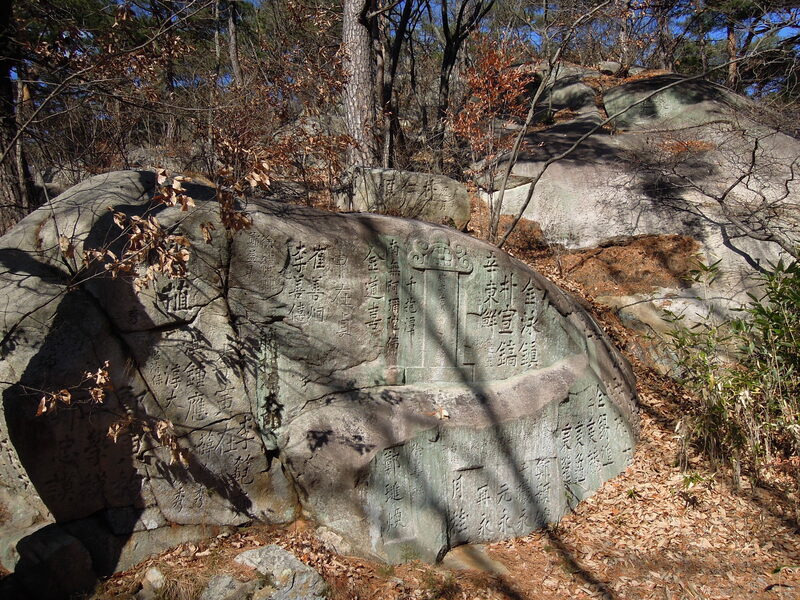 The river trickling between icy pools of water and large dusty grey boulders marked the left side of the path and to the right there were Buddhist carvings in the boulders that were threatening to stumble out from the forest. The temple entrance was guarded by four huge and rather angry looking figures (‘heavenly kings’), their mood only lightened by their colourful paint jobs. I guess they ward off evil spirits from entering or keep a wily eye on unscrupulous Englishmen like myself. Inside there were numerous temple buildings, most housing Buddhist icons and patrons in quiet contemplation. The architecture of the buildings were quite mixed, in previous temples I have visited colourful and intricate wooden buildings are commonplace. 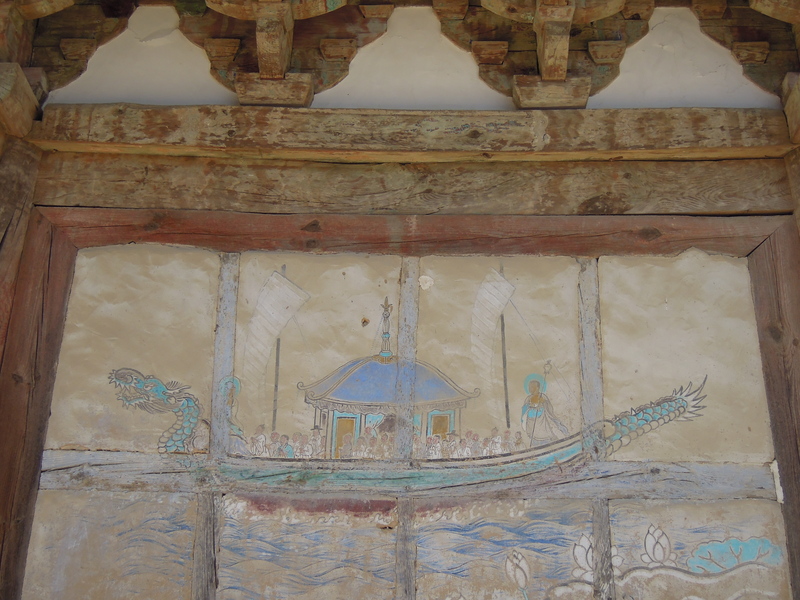 At Tongdosa there was certainly an element of variation with plainer and aged wooden buildings and some others adorned with weathered pictorial art, rather than just mere colourful decoration. 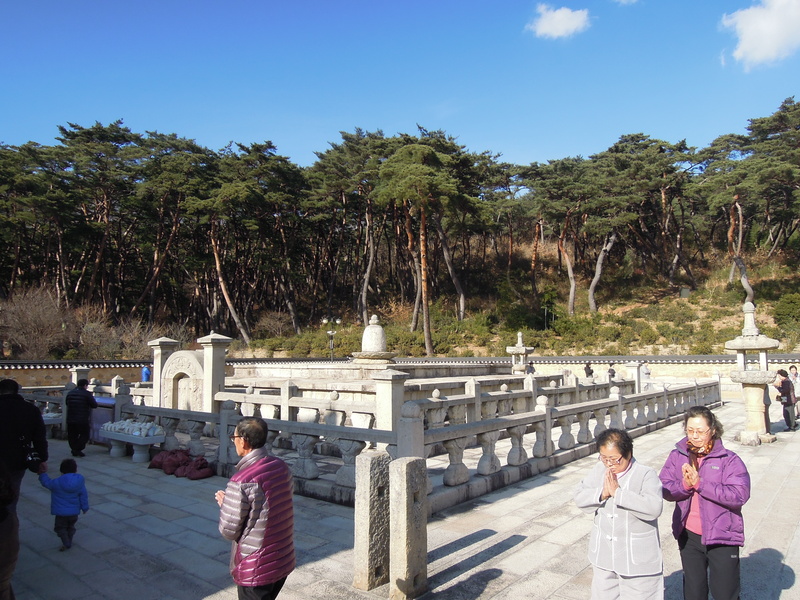 The temple grounds were bustling with families blessed with the day off from an ironically observed Christian holiday. Most seemed to be sightseeing but many were going about their religious habits; people bowing to statues and taking off their shoes to enter the buildings and give offerings of food or prayer to Buddha and his mates. 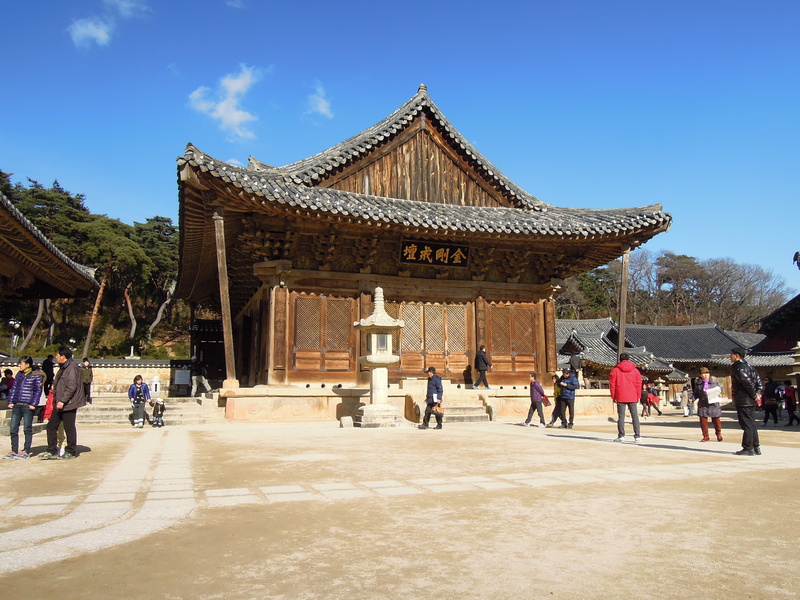 At one point within the temple there is a large square area (I have since discovered it is called the ‘Diamond Altar’). 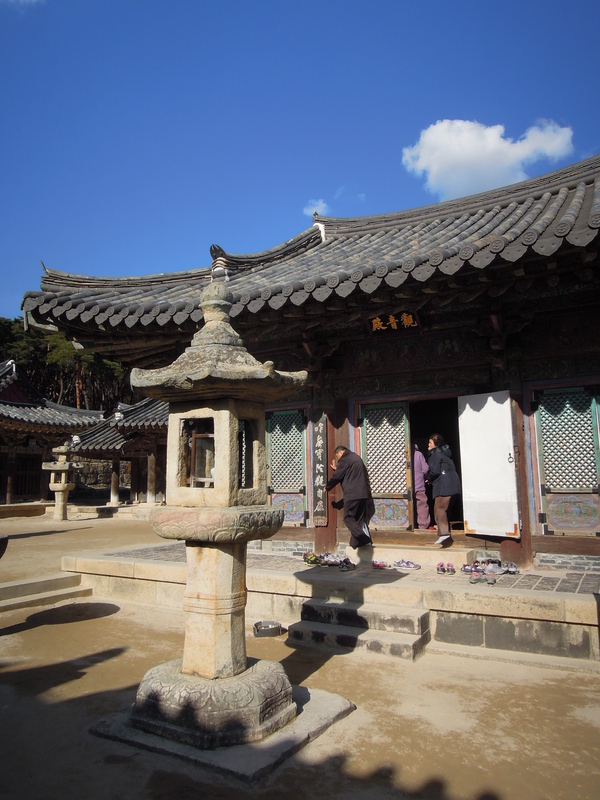 Stone barriers protect a kind of low-profile outdoor altar, people remove their shoes and put on outdoor slippers and walk round offering a little bow on each side of the square. Apart from the architectural features there was definitely a sense that this was a working place of worship. 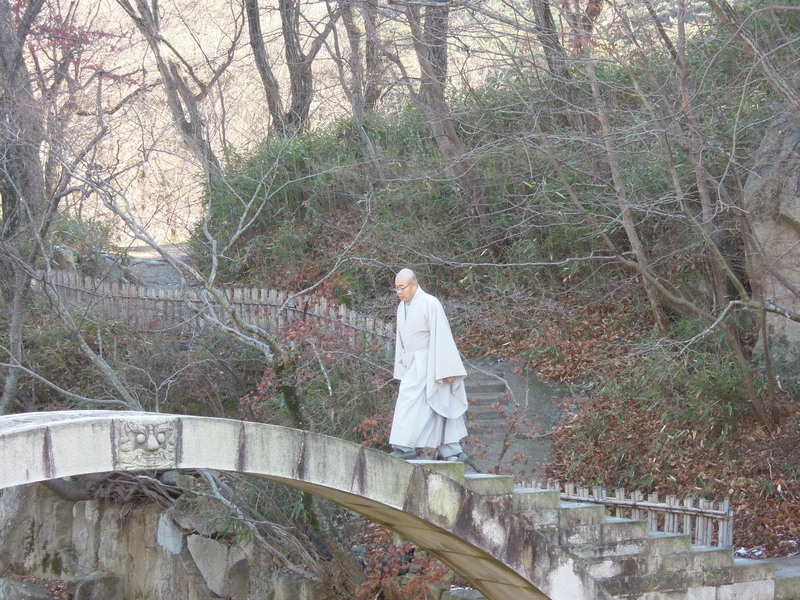 I saw many monks and even caught a cheeky photo of one crossing the famous single arch bridge at the rear of the temple. 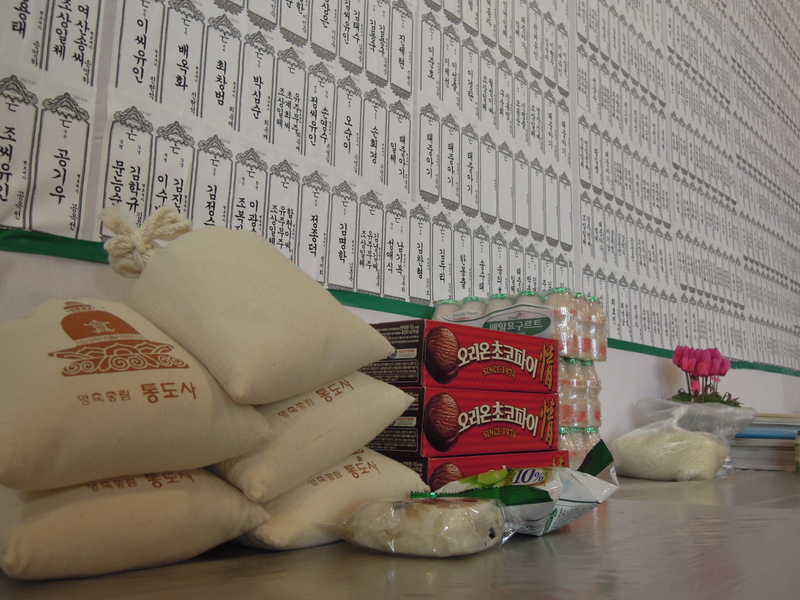 In addition, the main prayer hall was host to some monks offering a prayer or sermon to some patrons and little teams of ajummas were cleaning silverware outside the individual buildings and sharing some questionable Korean treats. 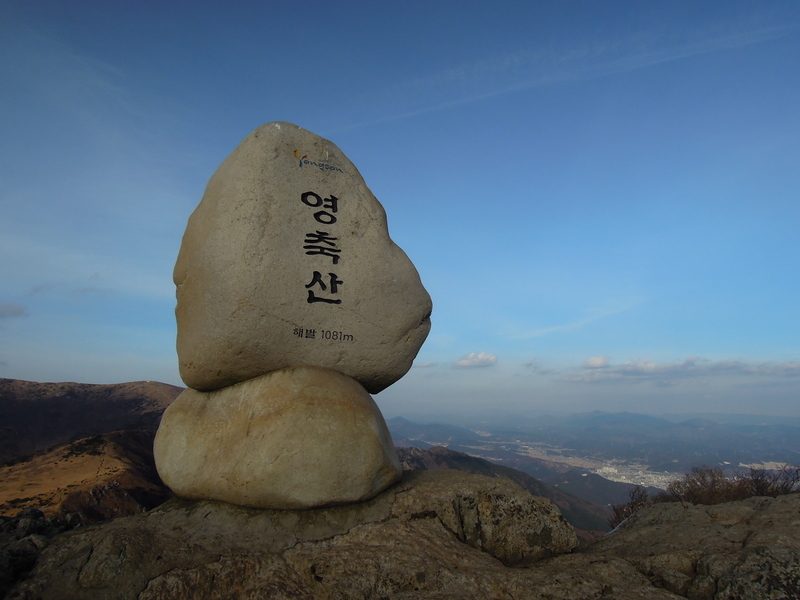 After spending some time walking around Tongdosa I felt it was time to begin the actual hike. 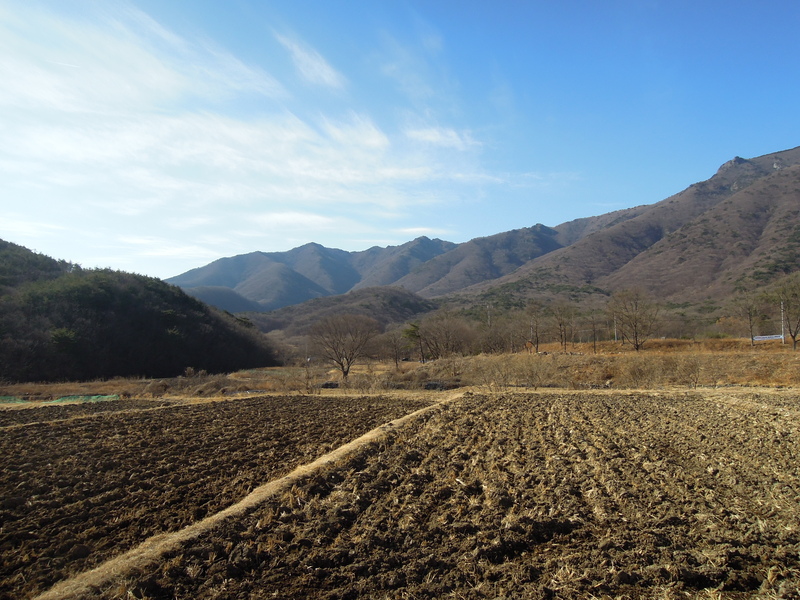 From the rear entrance I followed the river bed through some arable land until I came to the point where the road made way to trail and I was presented with the days major decision: To follow the Baekeunam or Biroam trail to climb Yeongchuksan. 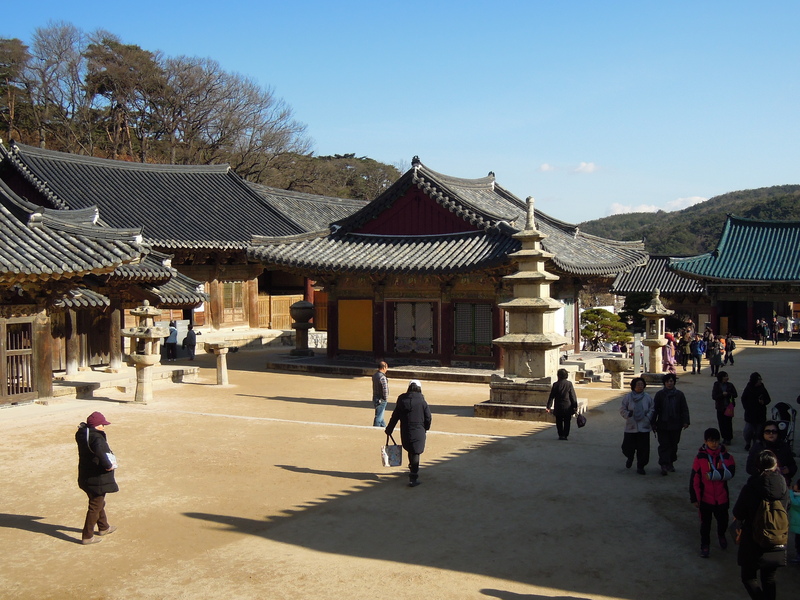 Previous internet research had led me to believe that Baekeunam was rather pleasant and scenic, well-marked and had staircases where the trail got steeper; whilst Biroam was “possible but poorly marked and brutally steep’. I’m all about testing myself and chose the Biroam route. The initial climb on the Biroam trail was fine. A winding trail ascended the lower slopes of the mountain and and led to Biroam, a quaint hermitage. The area around Tongdosa is littered with these hermitages, quiet retreats for self-reflection for the followers of Buddha’s path. I took some time to look around the small and perfectly preserved and decorated grounds. The colours were bright, fresh and vibrant and there was no one insight but myself. To the left of the hermitage the trail ‘began’. Brutal is a generous way to describe the climb. I’m not a mountaineer but I consider myself to be very fit and I have done a considerable amount of hiking from school age to now. I’ve climbed some large mountains around the world but this was definitely amongst the most difficult terrain I have encountered. 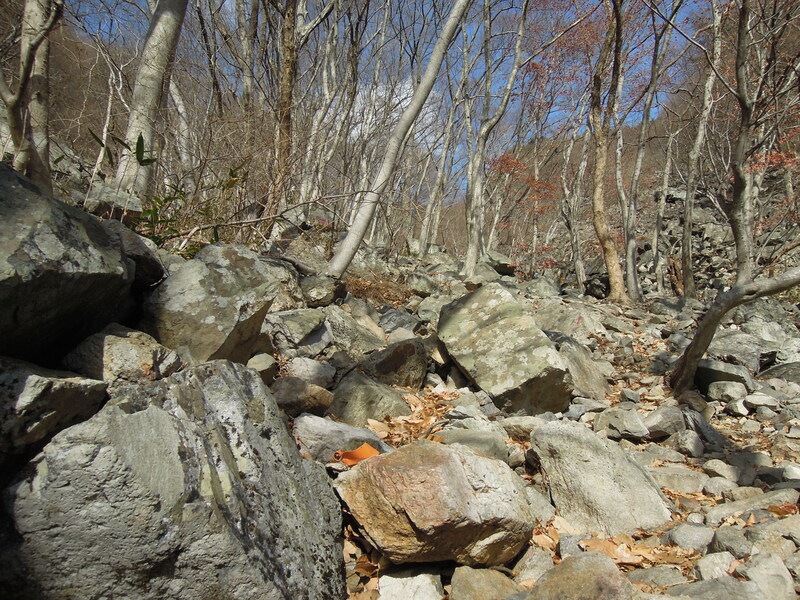 The ‘trail’ was marked only by occasional yellow and red tags hanging from tree branches and spray painted red arrows with no distinguishable worn pathway, mostly because the ground was littered with large boulders like in the picture above. During my ascent I encountered two pairs of people. The first group stopped and told me in broken English it was very difficult to climb, I said that was good in broken Korean. I got a laugh, a high-five and a good luck. The second pair stopped me and said I should go back and questioned my choice of running shoes over hiking boots (which I don’t have and have never needed in Korea). Despite the rocky terrain and drifts of leaves, that hid either more rocks or big leg breaking holes, I made good time over the initial face. 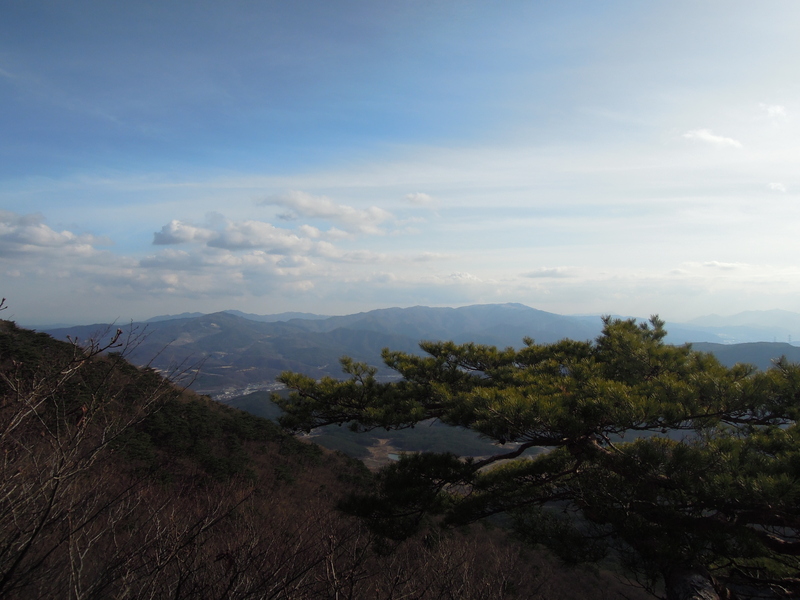 As I emerged from the treeline I was presented with a view across to the previous weeks hike on the other side of the Nakdong valley. As I turned back to the climb in question I hit my first real troubles. Above the tree line is the ominous ridge. A steep cliff a few hundred metres tall. Although the ‘trail’ was not clearly marked or visibly evident as being used, by anyone, at all, ever, I was under the impression that it would have been maintained, in some way by the park authourities, so that there was a physical way to ascend the most difficult parts. As the red and yellow tags disappeared I was left on my own to climb the cliff face. In most cases I found a manageable way to scale the jutting and precarious rocks, despite going down a few dead ends and finding myself stuck and having to turn back and look for another route. On two occasions I was fortuitous to find some ropes that assisted the worse of the vertical climbing, although a fall with no safety rope would surely result in serious injury. 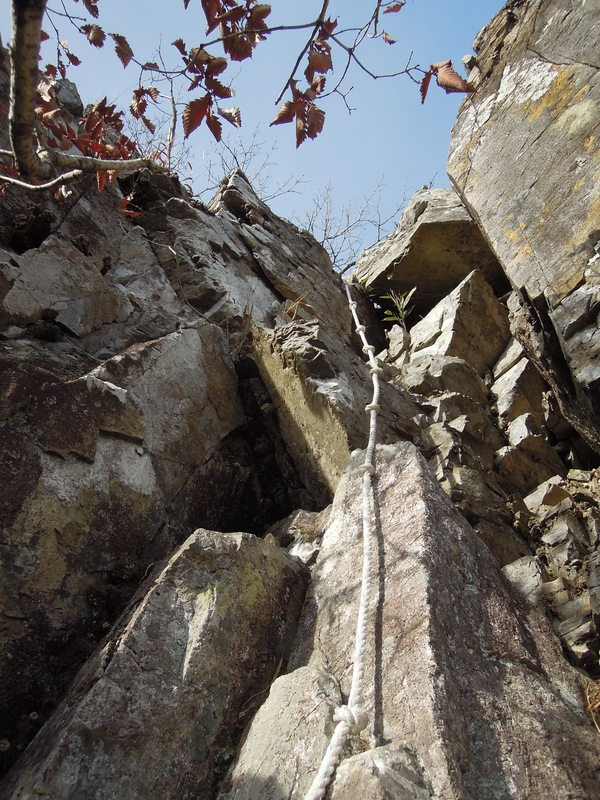 The picture below demonstrates the steepness of the rock face with the treeline directly below. 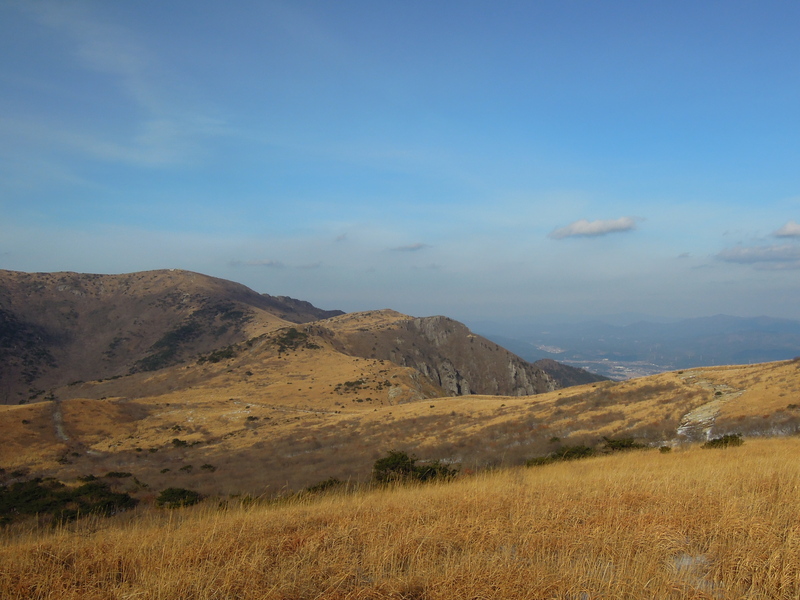 Ultimately I achieved my goal and arrived at the top of the ridge and found a well worn path (that came from the Baekeunam direction..) that led to the summit. The fear of being badly injured and alone on a mountainside produced enough fear and adrenaline to rather foolishly push on where I think most people would have turned back. The feeling as I emerged safely from the labyrinth of soaring rock was worth it. 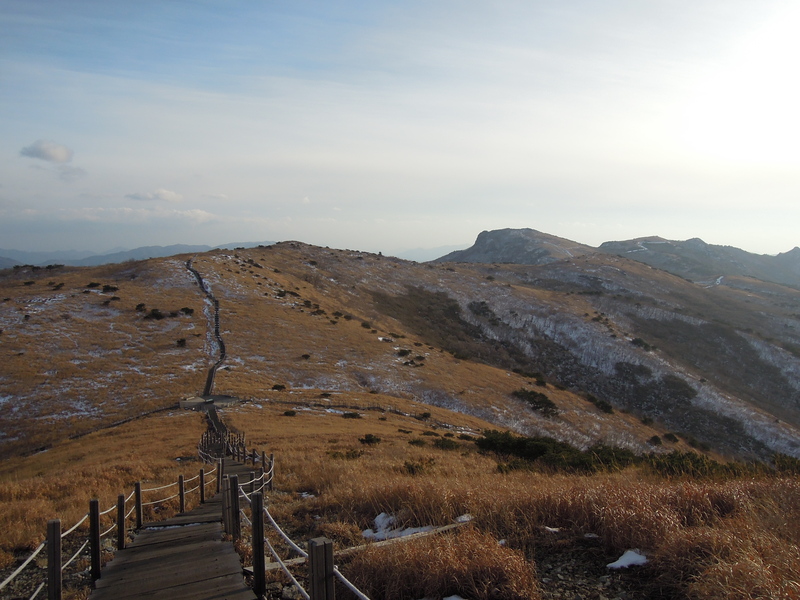 The path above the rock face lead to the first summit of the day the 1081m Yeongchuksan. 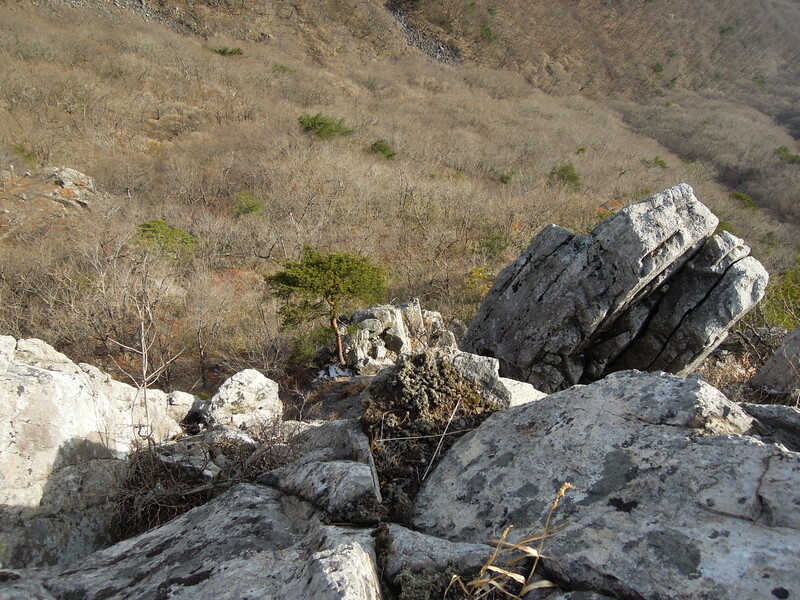 Feeling the burn in my muscles from the climb I took a breather with a group of Korean men who were on a hiking trip. 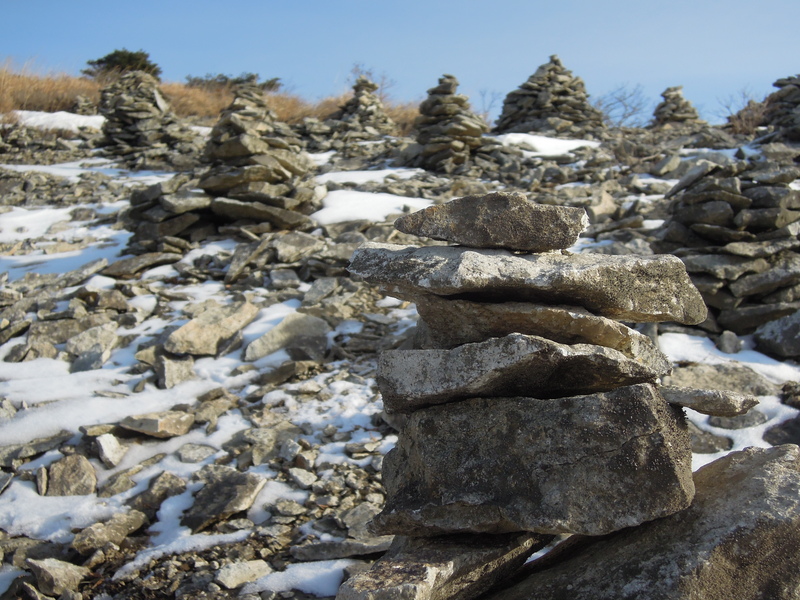 One of them kindly offered me some nuts and asked about my trip to the Yeongnam Alps. When I told him I had climbed from Biroam he could scarcely believe it and took great pleasure in telling his hiking friends. He summed up the route by proclaiming “I hate Biroam course”. As they headed off he shouted to me to get moving soon as the light was going and he knew I wanted to hike the next three and a half kilometres to Sinbulsan. The hike to Sinbulsan was incredibly beautiful, the clouding skies and the low sun meant everything was illuminated like a Turner painting. The path was snowy and muddy where the snow had melted and I found it easier to walk amongst the silver grass that covers the pathway between the two peaks. The final climb was mostly made from wooden stairs (where were they thirty minutes ago?!) 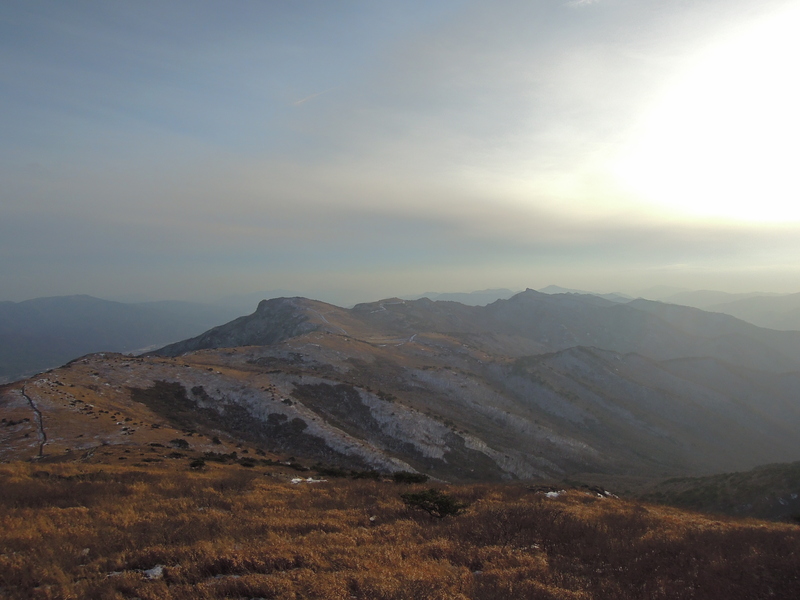 and led to the 1209m Sinbulsan peak. Having completed my two peak challenge it was now about time to quickly find a way to descend the mountain. 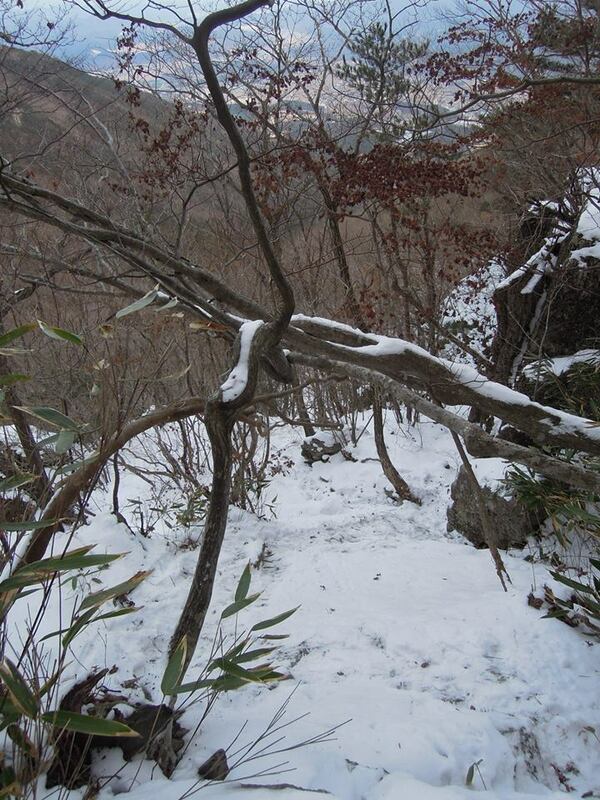 I had not planned a way home but a crossroads in the wooden stairs led me to believe that a path would lead down to a mountain village called Gacheon-ri. With the sun slowly setting behind me I began my descent on the shaded side of the mountain and quickly discovered that shaded meant that a good foot of snow still lay on the ground. Again there was no discernible path, either that or I lost the path that I first started on because of the snow layer. This meant a treacherous and dangerous ascent through snow, ice and boulders. Several times I found myself digging into the snow to make footholds on the incredibly steep mountain slopes or grabbing onto overhanging branches to prevent me from slipping on the ice and tumbling into the huge rock piles below. The descent was seemingly endless and I very nearly had a few ankle spraining or leg breaking accidents. I was caught between getting off the mountain before darkness and finding a safe place to put my foot with every step. Eventually, as I lost the battle with the night the rocks and snow began to dissipate and I finally stumbled upon a pathway that grew wider and the gradient shallowed. The sight of a road was immense relief and I walked the final few kilometres amongst the mountain farming community. The winding farm roads gave way to larger ones, a school appeared on the horizon and as I passed it a main road came to prominence and I sprinted the last 200m of my 17.26km hike to catch a number 12 bus back to Busan! There are many morals and lessons in life but most we read about or are taught in a classroom and never experience. 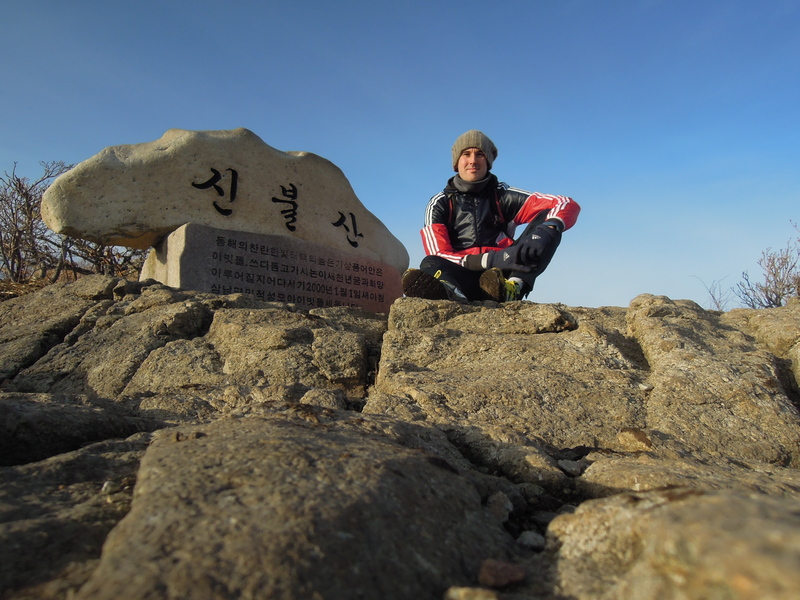 On Christmas Day, I relearned to respect a mountain, no matter where you are in the world.